The first budget of a new government is always an occasion to gauge the direction it will give to policies. In case of the National Democratic Alliance (NDA), led by Prime Minister Narendra Modi, the hope for change was overwhelming because change was a promise loud and clear in his election campaign. The first sentence of finance minister ArunJaitley’s budget speech termed the party’s victory a verdict for change. But as his more-than-two-hour-long budget speech unfolded, it became clear that the government had washed its hands of the theme of change by suggesting the public-private-partnership (PPP) model for almost all sectors of development, from rural development to defence. While the space cleared for private players makes the growth brigade happy, other crucial sectors where change was needed the most have been surprisingly left to continue without reforms. Down To Earth dissects the budget to see whether and how it has addressed the long-pending need for reform in key development areas. The current budget seems to have slowed down the pace of reform in Central schemes initiated by the previous government after 45 years. In June 2013, the erstwhile UPA government pruned the number of Centrally sponsored schemes from 147 to 66. It also decided to give states the freedom to use 10 per cent of each scheme’s budget according to its own ideas and priority. A year earlier a high-level committee headed by B K Chaturvedi, member of the Planning Commission, had submitted a report suggesting such changes. One of the suggestions was to do away with schemes with annual outlay of Rs 100 crore or less (‘Lean, mean scheme’, Down To Earth, February 1-15, 2013). The current budget has done the opposite. It has declared 28 schemes with Rs 100 crore allocations. These schemes include the BetiBachao, BetiPadhaoYojana, Van BandhuKalyanYojana and the Ajeevika-National Rural Livelihood Mission to name a few, that cover up to half of India’s population. Similarly, states have been demanding that all the Centrally sponsored schemes should be treated as Central assistance, thus, giving them more autonomy. This was not done despite Modi’s focus on “cooperative federalism”. The new budget has retained the last government’s 10 per cent formula. The current budget came during the mid-term of the 12th Five Year Plan, termed the health plan of India. By 2017, the last year of the Plan, the government is supposed to allocate 2.5 per cent of the GDP to health, an ambitious objective for India but one of the lowest allocations in the world. It was expected to boost the budgetary support to the health sector. In the past few years, a public debate over public health picked up and attracted political attention. But the current budget has increased the support by only 5.1 per cent from last budget estimates. Giving access to universal health coverage that includes free treatment and basic medicines has been NDA’s key campaign issue. This is also a national objective that is being pursued. The current budget expressed this intention tentatively but without the right budgetary allocation. The finance minister made umpteen announcements for the health sector but almost all focused on medical education and increasing tertiary care facilities. Since preventive or primary healthcare found no mention in the first budget speech of the NDA government, free drugs and diagnostic facilities are the only ray of hope for people. The UPA government had announced that basic drugs would be made available for free at all government health facilities and selected medical stores. Though the scheme was launched in some states, it did not take off and largely remained a promise on paper. In addition to the free drug service, Jaitley announced providing free diagnosis service. “Providing free medicine and diagnosis requires a huge amount of money. Budget allocation for health does not reflect this need. It is more like a populist statement made by the government,” says Ravi Duggal, India country-coordinator, International Budget Partnership. The river became synonymous with Modi as he contested the election from Varanasi. It is not for the first time that a prime minister took interest in the Ganga. But Modi and his key ministers have made it a priority. Everybody expected the agenda of change to be more pronounced while dealing with the Ganga. Jaitley proposed setting up an Integrated Ganga Conservation Mission, called Namami Ganga, and allocated Rs 2,037 crore towards the mission but without recognition that the programme must be reinvented to succeed. The finance minister uttered no word about the new direction needed to clean the river. Even the previous UPA government had made funds available, even secured a loan of Rs 4,600 crore from the World Bank for cleaning the Ganga. But all this money has not cleaned the river because the approach is flawed. It focuses on building sewage treatment plants when our poor cities lack sewerage network. 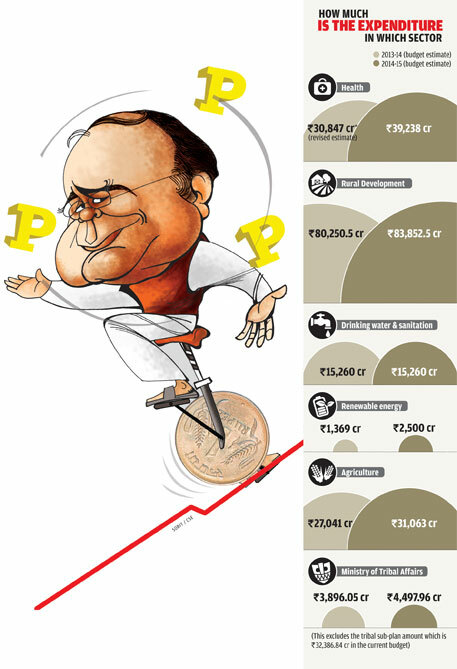 Jaitley has unveiled a populistbudget in the case of agriculture. 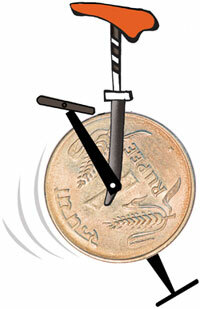 Overall, it was more of what the UPA government had been doling out in the past decade. There was a steep increase in farm credit, more warehousing and more research institutions, all of which do little to address the fundamental problems in the farm sector. What the 2014-15 budget has opened are the sluice gates for agriculture credit that has been increasing by leaps and bounds in the past five years. In the interim budget in February this year, previous finance minister P Chidambaram had set Rs 8,00,000 crore as the target for lending for the current financial year, and Jaitley says he will stick by this figure. It is another matter that such credit has benefited small and medium farmers very little. Much of this bonanza is boosting the fortunes of companies in the business of agriculture, from warehousing corporations to those running trucks with refrigeration unit, and even state electricity boards in the name of helping the priority sector. Clearly, the BJP government sees no problem in widening the credit pipeline, although there is little explanation as to how the money will flow to the millions of small and marginal cultivators who comprise the majority of the Indian farming community. Analysis by RBI economists has shown that small farmers got a mere 3.77 per cent of the credit in 2007, with the lion’s share going to big farmers or agribusiness ventures. It was the same in 2011-12 when then finance minister Pranab Mukherjee announced a big boost in total farm credit. Down To Earth had then pointed out that small and marginal farmers got only 5.71 per cent of the credit. Of all the Gujarat models that now guide bureaucrats to draft national programmes, the one on renewable energy has a few innovations. In his speech the finance minister used the terms “renewable energy”, “solar energy” and “wind energy” many more times than the word “coal”. This is a welcome departure from the past. While describing new and renewable energy as a priority for the government, he announced programmes like setting up of four ultra mega solar power projects and 100,000 solar power pumps that can deliver drinking water as well as water for irrigation. In addition, he has announced setting up 1-MW solar parks on the banks of canals. To promote manufacturing of renewable energy equipment like solar photovoltaic modules and wind turbines, he has also announced tax exemption on imported components. The size of the National Clean Energy Fund (NCEF) will now more than double because the cess on coal (which capitalises NCEF) has been increased from Rs 50 to Rs 100 per tonne. But is the package on renewable energy a departure from the past? No. In fact, these are the same “disjointed” schemes promoted by the UPA government. The budget does not mention renewable mini-grids, which the country needs. Nor does it talk about biomass or biogas energy. “Doubling of coal cess is a welcome step but there was no clarity on how this money will be spent,” says GyanaRanjan Panda, associate professor, public policy, Central University of Rajasthan in Ajmer. The new government is treading the path of the previous government which spent very little from NCEF on clean energy and more on other projects broadly seen as environment-friendly, he says. “Similarly, the Modi government has allocated Rs 1,500 crore for the Ganga Action Plan from NCEF. This is a violation of the fund’s mandate, he adds. Panda previously worked on renewable energy with the Centre for Budget and Governance Accountability, a non-profit in Delhi.